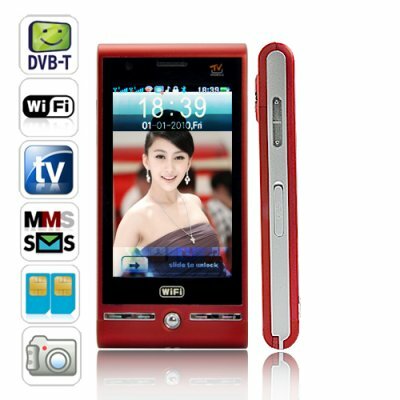 Successfully Added Barcelona Plus - Quadband Dual SIM Wifi Cellphone + DVB-T (Red) to your Shopping Cart. Elegant to behold and powerful to hold, The Barcelona Plus quadband dual SIM Wifi touchscreen worldphone represents the forefront of mobile phone technology with its vast array of cutting edge features! Quad band worldwide GSM compatibility, dual SIM, java apps, WIFI internet access! And to top things off this phone comes with a built-in DVB-T receiver so you can enjoy full-screen sports, news, weather, and your favorite shows all from the palm of your hand. Superior Technology: The Barcelona Plus mobile phone represents solid construction and core performance with support for the four global standard GSM frequencies(850MHz, 900MHz, 1800MHz, 1900MHz) which means it will work anywhere in the world. It's got room to insert two SIM cards so you can receive calls on both phone numbers using just one phone. What's more, it is an unlocked phone so you can not only use it anywhere in the world, but you can use it with any mobile network carrier. The Barcelona Plus also has a fantastic 3.25 inch touchscreen and comes with WIFI, so you're always a few clicks away from free Internet. Throw into this incredible mix, Bluetooth functionality, improved firmware and interface, and you have all the ingredients of a winning cellphone for every aspect of your busy life. Design Innovation: The design philosophy behind The Barcelona Plus mobile phone, is everything you would ever need in the palm of your hand. It has an updated candy BAR form factor (hence the name BARcelona). It's got a built-in dual front and rear 192,000 pixel digital camera and camcorder, a top of line MP3 / MP4 player that effortlessly rocks your world with playability for the Internet's hottest file formats, the ability to install Java 2.0 apps - and get this, The Barcelona Plus even comes with an accelerometer mechanism like on the Apple iPhone, so with the flick of your wrist you can change things like your desktop wallpaper or skip to the next song. The Barcelona Plus is a winning formula for increasing your online sales. Buy it for about 115 dollars, sell it for 165 for a cool 50% profit. Brought to you by the leader in factory direct China electronics - Chinavasion. It`s like the football team!!!! Barcelona is all !!!! I was very surprised by its functions.The only thing you can do is order it !!!!!! ITS VERY NICE..THE COLOUR..THE THINGS THAT YOU CAN DO...ALL...JUST PERFECT!!!! very nice mobile many capabilities and fuctions!! IT IS VERY BEAUTIFUL VERY EASY TO USE AND IT HAS A LOT OF THINKS TO DO.IT S FANTASTC!!!!!!!!!!!!!!!!!!!!!!!!!!!!!!!!!!!!!!!!!!!!!!!!!!!!!!!! !